When we all saw the 1960 Olympic Marathon on television or in the cinema with Abebe Bikila winning in the dark in Rome from Abdessalem Rhadi with Barry Magee finishing in third, we all thought, “I’d love to have been there, even to see it!” Very few of us knew that a man who had run in the McAndrew Relays, the National at Hamilton and competed in his club’s Christmas Handicap was actually part of the field. 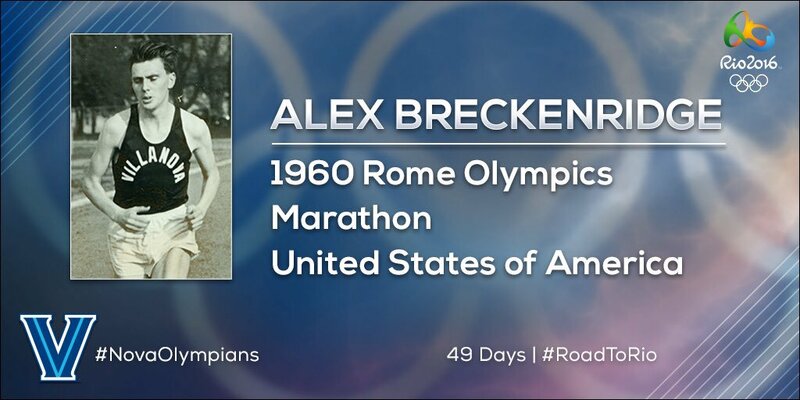 Alex Breckenridge, formerly of Victoria Park AAC, finished thirtieth in that, the most dramatic of all Olympic marathon races. Like Paul Bannon and Mike Ryan, he was one that had got away. Born in Buffalo, New York in America on 17th April, 1932, he had been brought up in Scotland but after a spell with VPAAC he went on a sports scholarship to the States returning for only one year before going back to the USA and joining the Marines. He was one that we could ill afford to lose. His career was so full both here in Scotland and in America that it is clearly impossible to cover it all. This is only a hint at what was a wonderful athlete’s time in the sport. “At last Scotland has a coterie of athletes taking the challenge of the ever-increasing standard of world athletics. Whilst post-war athletics over the border and on the continent no less than other parts of the globe had an upsurge reflected in all-round brilliant performances, with the notable exception of high jumper Alan Paterson, home athletics remained in the doldrums. With, as it were, Andrew Forbes as the harbinger and pointing the way, we now have a group: Eddie Bannon (Cross-country), Ian Binnie (3 and 6 miles), David Gracie (400 hurdles) and Alex Breckenridge (1 and 3 miles) reaching within the orbit of world ranking and recognition. The latter, Alex Breckenridge the youngest of the group has jumped into major prominence only by virtue of his performances in recent weeks culminating (to date) in his great 4 mins 11.2 secs Mile at the Police Sports when finishing third but downing Dwyer (USA), Nankeville, Parker and Green (GB). His progress merits our study. The presentation here has a two-fold purpose. Firstly as a tribute to the efforts of a most likeable, purposeful but modest athlete. Secondly to inspire others to reach out to greater heights. Perhaps this will be done by capturing the spirit of his drive and acknowledging the willingness for training work. Like the vast majority he is a working fellow with no special privileges. But he is imbued with a telling enthusiasm. Like all true sportsmen, his approach is as open as a book, no ‘closed shop’ or secret training methods. He is concerned to see our sport flourish. What he can do, even by taking a completely different road, you may better. Only it can’t just be wished, you must try! His first real entry to the athletics arena was when he finished second to RC Calderwood (4 min 52) in 5 min 06 sec at Govan High School Sports in 1959. A few weeks later he ran fourth (about 5 mins) in the Glasgow High Schools Mile to Fred Robertson (now Garscube) in 4 min 49 secs. At this early stage, and as yet unattached, he was perhaps foretelling the characteristics that have featured his running recently. This ambitious youth was not overawed by variety in distance. His first open race was in Rangers Mile handicap (110 yards) and however unwise it may seem a fortnight later he entered and finished the Milngavie 10 miles road race. The cross-country season following he joined Victoria Park AAC. He found cross-country racing hard going but was pleased at finishing 17th and last counting man in VP’s winning team in the Scottish Youths Championship (1950). With his training based on the lines followed by Andy Forbes, he became popularly known as ‘The Third Man’ in the track season reducing his handicap from 125 yards to 60 yards. He had twelve places – ten thirds and two seconds. Best mile time, 4 mins 39 secs. Cross-country 1950-51 saw him stepped with seniors in VP’s winning Midlands relay team. He won his club’s junior and finished eighth, second team, in the National 7 Miles Cross-country. 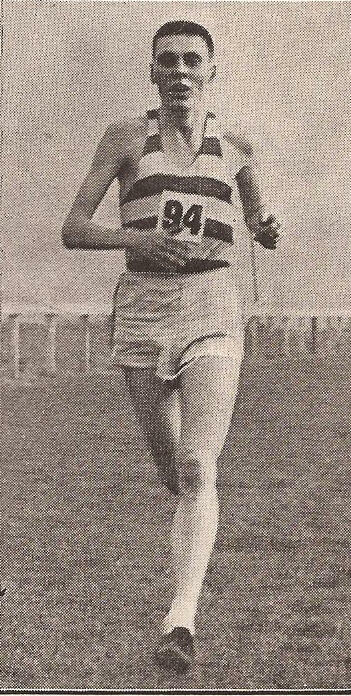 Influenced largely by the work and results of clubmate Ian Binnie he changed to a completely new pattern of training in the 1952 track season. He had just turned 20 years of age. Orthodox set schedules of fixed distances and time trials, etc, were out and instead he concentrated on the more free ‘fast-slow’ or ‘winders’ principle: ie easy running interspersed with fast 150 yards bursts. These ‘bursts’ are not actually sprints but more retaining distance form but very vigorous and as hard as one can go. For no apparent reason his 2 mile form varied considerably this season. His best was 9 min 39 sec. With an uncomfortable 4 min 31 sec heat he qualified for the Scottish mile final and after his previous night’s struggle, he surprised himself by finishing 3rd in 4 min 23.7 sec. Now here is his full and amazing 1953 track performances to date (minus club competition which he enters and takes in his stride). It includes 600 yards to a mountain race! And, watch the progress. 2nd May – Kilsyth. Half mile heat. 1st 2 mins off 20 yards. 2 miles 1st – 9 mins 40 secs. Half Mile final, up to leaders but could not hold effort to tape. 5th May – Scotstoun – 3 miles scratch – 2nd. 14 mins 42 secs. 9th May – Vale of Leven – 2 miles. 1st 9 mins 25 secs. 16th May – Scotstoun – half mile, 2nd 1 min 57 secs of 20 yards; 1 mile 1st, 4 mins 19.5 secs off 25 yards. 23rd May – Bonnybridge – Open half mile, 2nd; Open mile 3rd and 600 yard relay leg. 25th May – Goatfell mountain race (approx 9 miles) 1st. A stamina test and mental relaxation from track work. 30th May – Ibrox (Glasgow Highland Gathering) – Inv Mile – 1st, 4 mins 9.7 secs off 70 yards. 2nd June – Edinburgh L&C Sports – 2 mile scratch – 1 mile time 4 mins 40 secs, so took pace but Ottenheimer (Yugoslovia) held on and sprinted past the last furlong winning in 9 mins 11 secs. AB’s time 9 min 15.2 secs. Running coming much easier and intent to combine competition and training as best as possible. 13th June – Ibrox – 1 mile scratch – 3rd – 4 mins 11.2 secs. 1 Mile Open 4 mins 17.4 secs. 17th June – Larkhall – 1 Mile Handicap, 2nd, 4 mins 17 secs (approx). 20th June – Helenvale – half mile – 1 min 56.6 secs. Sunday Afternoon: 3 Miles made of half a mile jogs and 300 yards strides. Monday: Run from the house at 11:00 pm about 2 miles brisk stride. Tuesday: 2 – 3 miles ‘Winders’. Wednesday: Either as Monday or Tuesday.Thursday: As Tuesday probably including a 600 yard stride. Friday: Easy 2 mile road run. Saturday: i mile easy jogging as slow as desired before race. Plenty of glucose. Over and above he runs part of the way to work roughly 2 miles in the morning and to and from at lunchtime, fully clothed. In winter this may mean with heavy coat and gloves! There were also hints that he was interested in a military career but nothing was to happen on that front – yet. He did indeed leave on an athletics scholarship to Villanova University where the head coach was the renowned Jumbo Elliott and he was to become part of the greatest ever University squad. Just note some of the names in the picture below, not least Olympic 1500m champion Delany and world pole vault record holder Don Bragg. 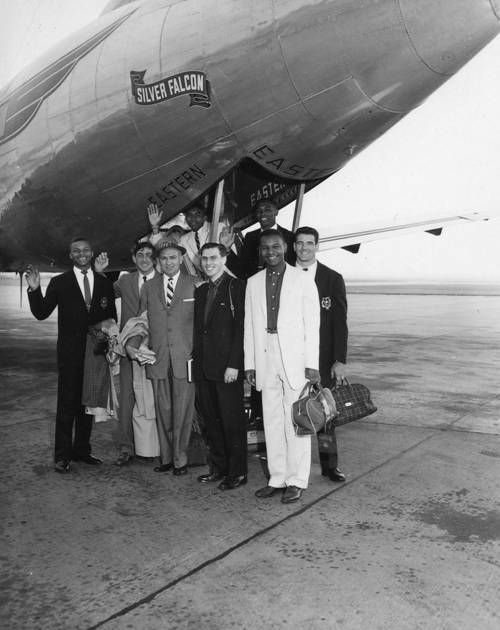 Villanova team in 1957 with Ron Delany and Alex Breckenridge on either side of coach Jumbo Elliott., also in the picture are Ed Collymore and Don Bragg. In inter-college athletics Alex was mentioned often as the man to beat in the Mile or Two Miles – eg Before one meet, The Harvard Crimson referred to ‘the favoured Alex Breckenridge in the two mile’ in 1956. He took part in many events – when an attempt was made on the four minute mile in the Atlantic Boardwalk mile, he was asked to take the pace for the first half mile which he did, but he was feeling so good that he ran on and finished first which meant of course beating the pacer for the second half mile! The Villanova distance squad was clearly to be feared – in April 1956 they won the Quantico Distance Medley Relay (“An indication of the quality of the entrants in this meet was the distance medley relay in which winners Villanova ran Charles Jenkins, Warner Heitman, Alex Breckenridge and Ron Delany”) and also the Penn Distance Medley Relay with Ed Collymore, Charles Jenkins, Alex Breckenridge and Ron Delany. No doubt there were more but these will suffice as an indicator of the runners with whom he was ‘mixing it’. 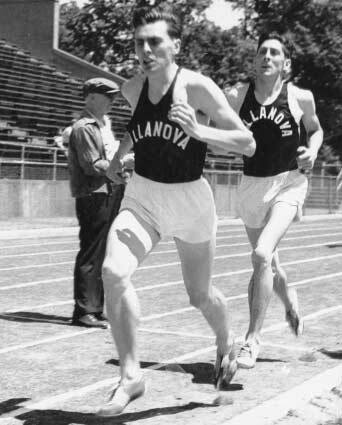 He was now referred to in some reports as ‘Villanova’s ace.’ When they won the NCAAA Championships in 1957 Delany won the Mile but Breckenridge finished fourth in the Two Mile Run in 9:03.4, one place ahead of Leonard ‘Buddy’ Edelen (9:05.4) who would later go to England to improve his athletics! In 1959 he was US AAU Champion at both 15,000m and 30,000m and at the PanAm Games in the same year he was sixth in the 10000m Marathon selections always cause some controversy if only because any one off race can be affected by unforeseen occurrences and the US selection for the 1960 marathon was no exception. Apparently the selectors had said that two events would be taken into consideration, the Yonkers and the Boston Marathons, and the first three finishers in these races would be taken. Two men, Alex Breckenridge and Gordon MacKenzie were clearly qualified by this rule but Johnny Kelley failed to finish the Boston race which meant that he was ineligible. The East Coast elite were pushing for Kelley, most of the others were pushing for Robert Cons. However it worked out, Alex was a certainty! In the Yonkers Marathon, he was third in 2:32:41 and in Boston, sixth in 2:28:44. The Olympics were held on 10th September 1960 in Rome and he finished thirtieth in 2:29:38. One place ahead of him was Brian Kilby of Coventry Godiva and England, Watanaba of Japan was thirty second and the aging Alain Mimoun thirty fourth. He was in good company. It is difficult to find more information after that date but his personal best performances have been listed on the internet as follows. Maybe a better indicator of his status was the number of times he was ranked among the top ten American athletes at the end of a season. Being in the USA Top Ten once would be a remarkable achievement to do it as often as Alex did over a seven year period is a measure of consistently high performance. Look at the table. 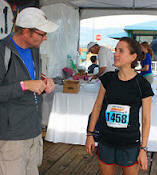 * Top ranked was Leonard (Buddy) Edelen with 2:18:57. If you want to see how he did in USA Track and Field Championships, then here it is. Remember that these are placings in the finals of US Championships at a time when men like Jim Beatty, Bill Dellinger, Max Truex, Don Bowden and company were all running. The last serious results that I can get for him in terms of rankings or championships are for 1963. If you want to do a search for his (or any other American) results in championships or rankings, then a good website is http://trackfield.brinkster.net/USAMain.asp?P=F where you can wander around results from before you were born up to the present day.